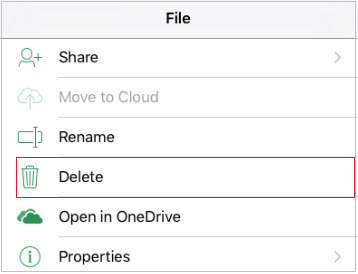 You can delete Office files from your iPad or iPhone, Windows 10 mobile device, or Android device. Tap Open and tap the service in which you saved the file (OneDrive, Dropbox, or a team site). If you have a file open, tap Back first. Find the file you want to delete and tap File actions > Delete. On your Windows 10 tablet or phone, go to where the file is stored, and delete it from there. If your file is stored online in OneDrive, you can use the OneDrive app to find and delete it. Open File Explorer to find the file. Press and hold the file name to open a list of actions, and tap Delete. Tap Open and tap the service in which you saved the file (OneDrive, Dropbox, a team site, or your device). Find the file you want to delete and tap More > Delete.